Your Sponsorship Dollars Make All The Difference! While making an investment into the exposure of your business, you help us inspire young talent in the pursuit of the arts. 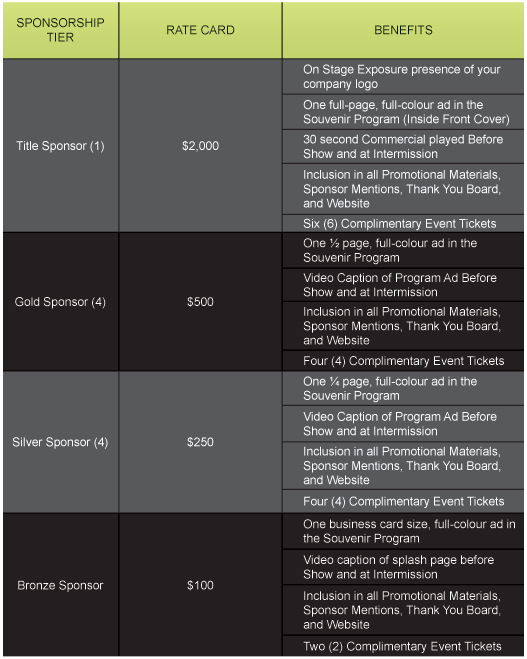 Your sponsorship dollars target a broad demographic over a lengthy time period. Your company logo will reach your audience several months before the show in promotional materials and advertisements. During the show sponsorship logos are displayed prominently in several types of media. After the show, your company logo continues to live on in our Souvenir Programs, our Spotlight website, thank you board, and post show materials. Your Sponsorship investment is invaluable. Please contact us by March 16, 2010 in order to be included in our promotional materials.